How Warm Is Your MacBook When Running? Will Seagate Build a Flash SSD Foundry? "Future versions of the MacBook Air will pack larger-capacity but lower-cost solid-state drives, emblematic of the next generation of flash storage that will make a quick descent from current stratospheric pricing. "Today, a consumer pays dearly for a solid-state drive (SSD). For example, for only 64 GB of SSD storage on the MacBook Air, a consumer must pay a premium of about $1,000 over the 80 GB hard disk drive model. "But the cost per megabyte of solid state drive storage will drop as notebook PC makers like Apple switch to solid-state drives with capacities above 100 GB based on multilevel cell (MLC) technology. Adoption by notebook PC makers is expected to start in the third quarter, according to industry sources." "Just as the experience of pain varies from individuals, so is our evaluation of how hot a Mac laptop can become. Apple says they can become 'very warm.' We can appreciate that warmth in the winter, but it can be a pain for summer computing. "Apple refreshed its Apple Portables: Operating temperature technical note. It says not to worry about 'very warm' laptops. There's nothing in the note about 'very hot.'" Link: How 'Warm' Is Your MacBook Operating Temperature? "PC vendors, such as Dell, Acer, Asustek Computer, Toshiba, and Lenovo all have plans to launch 15.6-inch notebooks, forming a new trend in the second half of the year, the sources commented." "The ebullient Seagate CEO Bill Watkins has made it clear that Seagate thinks flash solid state drives (SSDs) are interesting and Seagate will sell them - but not yet. When Seagate does sell a Seagate-brand SSD how will it make it? Will there be a Seagate flash foundry? "A customer buys a hard disk drive (HDD) array from an OEM or channel source and the innards consist of a controller from LSI or someone similar and disk drives from Seagate or someone else similar. Seagate makes drives but not controllers. "A flash SSD array or array component will consist of a flash array controller and flash SSDs, which consist of flash chips and the SSD-level controller, roughly equivalent to the HDD integrated circuit board sold and supplied by Seagate as an intrinsic part of the hard drive. "So, logically, Seagate would sell to OEMs a flash SSD equivalent to a HDD unit; that is to say, a bunch of flash chips and control electronics. Will Seagate make the flash chips?" Link: Will Seagate Build a Flash SSD Foundry? "Computex Acer has launched its Eee PC wannabe, the Aspire One, pitching the product to Brits at just £199 including VAT - even though it's 'not a low-cost notebook', according to the company. "The One's specs largely match those of its rivals: 1.6 GHz Intel Atom N270 processor; 512 MB of 533 MHz DDR 2 memory with a single SO-DIMM slot for more; and an 8.9in, 1024 x 600, 262,000-colour LED-backlit display. There's a 0.3-megapixel webcam in the screen bezel." "Via Technologies released the hardware design for a low-cost laptop with WiMax support under an open-source license on Tuesday, a move intended to make customization easier and shorten design cycles for system makers. "The CAD (computer-assisted design) files for the OpenBook reference design can be downloaded for free and made available to anyone under the Creative Commons Attribution ShareAlike 3.0 license. The terms of this license allow the CAD files to be freely copied, shared and modified. "The OpenBook is based on Via's 1.6 GHz C7-M processor and VX800 chipset. The design includes an 8.9-inch screen with a resolution of 1,024 pixels by 600 pixels and calls for a hard disk with a capacity of 80G bytes or more"
"AMD launched its long-awaited Puma laptop platform this morning into an unexpectedly open market after Intel was forced to delay its refreshed Centrino 2 ['Montevina'] platform. "Puma is built around AMD's Turion X2 Ultra Dual-Core Mobile processor but the vendor has put HD at the centre of its pitch. Puma features integrated ATI Radeon HD 3200 Graphics and supports DirextX10. It will also offer other discrete ATI Radeon graphics set-ups. Part of the pitch is its ability to run both the built-in and discrete graphics set-ups in tandem." "At the logic level, MacBook, the benchmark for success in mainstream notebooks, is unremarkable - indistinguishable from every PC notebook built on Intel Core 2 and its chipset-integrated graphics. Why, then, can't anyone with the same parts list emulate Apple's growth in an otherwise stagnant notebook market? Because Apple painstakingly hand-optimized its OS for a tiny variety of hardware architectures, presently Intel Core 2, while Microsoft wrote Vista to run on absolutely everything. No PC notebook maker can take the proprietary route that Apple plays to such advantage. "Microsoft can't crank out proprietary cuts of Vista for each notebook vendor's choice of suppliers. The best hope is a hardware architecture that's optimized for Vista. Not only that, but optimized for 64-bit Vista running on a battery. That radical objective drove AMD's design for the total notebook platform nicknamed Puma, and now dubbed, temporarily I hope, AMD's Next Generation Notebook Platform. This platform's Turion X2 Ultra 64 CPU is not cut from the common cloth of adapted desktop platforms like Core 2 that rely on machinations of the OS to balance performance with battery life...."
PR: Designed with top-of-the-line notebook computers in mind, Western Digital's high performance Scorpio hard drive delivers the capacity and speed needed to supercharge a notebook PC without compromising battery life or quiet acoustics. Features like these also make this drive an outstanding option for compact desktops, external hard drives, gaming systems, and blade servers. Massive capacity - WD's 320 GB 2.5" drives offer huge capacity for space-hungry operating systems, with plenty of room left over for photos, music, and video. Quiet - In a notebook drive, silence is golden. WD's exclusive WhisperDrive combines state-of-the-art seeking algorithms to yield one of the quietest 2.5" hard drives on the market. Free-fall sensor = As an added layer of protection, if the drive (or the system it's in) is dropped while in use, WD's free-fall sensor detects that the drive is falling and, in less than 200 milliseconds, parks the head to help prevent damage and data loss. 320 gigabyte capacity street price about $249. Have ExperCom replace the drive in a Mac laptop you already own: ExperCom will replace your hard drive with a Solid State Drive*, transfer your data to the new SSD, and ship back your Mac laptop to you. The hard drive, removed during installation, is also included with your Mac that is returned to you. Reliability: No moving parts means the risk of mechanical failure is extremely rare. You'll enjoy greater durability and improved resistance to data loss in the event of an accidental drop. Also, there is no noise and less heat is generated. Faster Access Time: Solid state drives can access data more quickly than standard hard drives, so you'll enjoy a boost in performance when starting up your computer and opening files and applications. 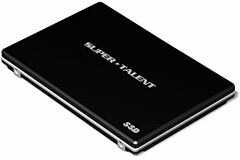 ExperCom is using the Super Talent SSD with a maximum read speed of 120 MB/s and a maximum write speed of 40 MB/s. Less Power Draw: Solid state drives require less power to operate, potentially increasing battery life. Cost: Solid state drives cost more per gigabyte than standard hard dives. 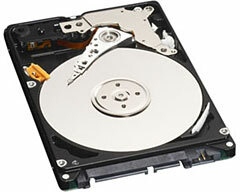 Capacity: Solid state drives have smaller capacities than standard hard dives. 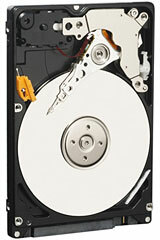 Slower Write Times: The write times for solid state drives are typically slower than standard hard drives. PR: The professional choice for Blu-ray recording: Easily save 50 GB of digital data on 1 disc, BD (Blu-ray)/DVD/CD writer in one drive. Burn up to 4 hours of HD video on a Blu-ray disc without quality loss and then share it with your customers or send your high-quality master for replication. New Blu-ray technology allows you to archive large amounts of data, audio asset libraries, raw video shoots, image files or complete multimedia projects on long lasting BD media - at a low cost per GB. Easily back up as much as 10 DVDs worth of important files at a fast throughput of 18 MB/s. Backward compatible with CD/DVD media, it also offers a compelling interactive multimedia experience when playing back your BD-ROMs. Bundled with full-featured, easy-to-use software, including packet writing and backup applications, it's the LaCie Blu-ray burning solution for intensive professional use. New this week; MacBook Airs! - and some high-end 17" MacBook Pros. Each model comes with an Apple one-year warranty, and ground shipping is free.